It seemed like a good time to meet again with a musician who has said so much musically in such a short span of time. We meet at the Zav Coffee Shop, a sun-splashed fixture on the southern end of The Danforth. It is a trendy place and we are both consumed by the canvases (including a couple of paintings by Lise Gervais [1933-92]) on its white walls. Allison Au is busy planning for performances at all of the major Jazz festivals in Canada during the Summer and Fall of 2018. 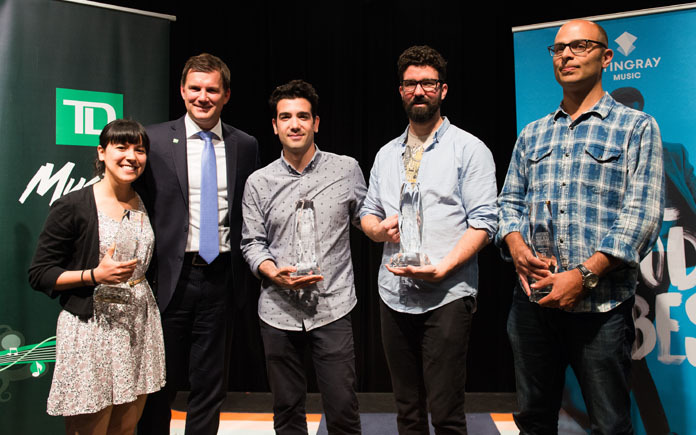 She will be at the Toronto Jazz Festival which takes place at the end of June and her invitation to Le Festival International de Jazz de Montréal comes as part of the TD Grand Prix du Jazz that she won in 2017. So also does the appearance at the Festival Jazz International de Rimouski, édition 2018 in August. Starting June 14th, Miss Au and her quartet will begin its western swing taking her newly composed music on the road to “workshop” in Calgary, Lethbridge and Medicine Hat, followed by appearances at Jazz Festivals in Western Canada – Manitoba: the TD Winnipeg Jazz Festival, British Columbia: TD Vancouver Jazz Festival and Alberta: TD Edmonton Jazz Festival… all this before heading home for two appearances at the TD Toronto Jazz Festival (27th of June, at the Rex Hotel and the 30th of June on the OLG Mainstage) and then on to an encore at Le Festival International de Jazz de Montréal , édition 39, 2018. Miss Au is visibly excited. 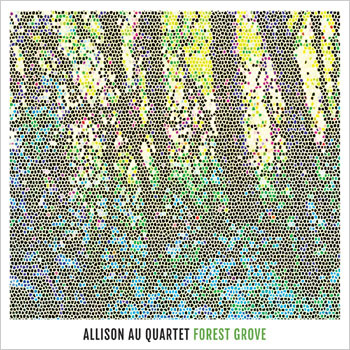 She’s been looking forward to debuting and – as she calls it – “workshopping” her six new charts on the road and before a wide spectrum of audiences before she goes back to the studio to record what will be her third album with the Allison Au Quartet. There is much to look forward to from the listener’s perspective as well. Miss Au has been studying piano again; this time to further her mastery of harmony – something that she is already prodigiously gifted at – and she is quick to add that this time she is exploring not only this aspect of music in greater depth, but as she says with “voice leading”, which will take her own prismatic voice to another level in that rarefied realm that she already occupies. I begin to imagine the exquisite, genteel tone of her alto saxophone, which gives every note the passion and purity of song – simple, and lyrical, abstract and profound. She is typically modest when talking about the place from where her compositions are emerging this year. “I’m trying to put a little more of technical aspects into the music such as being more mindful of voicing. I’m also approaching music from a different harmonic perspective, which is more mindful of the pianistic elements of the writing… I suppose it’s a direct result of my (new) piano studies and the fact that it’s broadened my harmonic horizons”. Already this is looking very exciting. Experiencing Miss Au’s music is a particular thrill. Her woodwind tones are a unique take on the twin-lineages of the cool and impressionism. Her soli are built on rippling jazz grooves that build from complex bop arpeggios and gentle glissandos. Her music is redolent of fragrant melodies built on subtle changes in mood, structure and tempo always making for a constantly interesting programme. Invariably her music has a considerable degree of balance and integration of melody, harmony and rhythm, of composition and improvisation of exploration, individuality and tradition – all impressively maintained throughout. Listening to the quartet play is like listening to four people singing individually and together and when vocalist Felicity Williams is added to the mix then a quintessentially celestial element is added in. Always, of course, it is the tumbling cascades of notes from the alto saxophone of Miss Au that rings true in the monumental edifice of Jazz. Not for her the relentless torrents of notes, honking riffs, biting attack; her trademark is her round sound, lithe and elegant as well as warm and swinging, with a tantalising symmetry of her lines which set off in angular directions and unexpected turnarounds, but always land exactly right, with their own fascinating rhythm. There is always a sensitivity and respect for pure sound. That and tradition is melded into sinuous melodies that are woven into magical tapestries by the four musicians, with Miss Au laying down the warp of the fabric. Also there is a sense of knowing exactly where the music should be in the grand scheme of Jazz. Recently Miss Au published a short essay in response to a request “from CBC” to share what it was like to live in the world of multiculturalism as the child of a Chinese-Malaysian and a Polish (white) Jewish mother. It was a moving piece that had all of the touchstones of walking the walk as someone who knew she was different and certainly, as we know now, unique as well. She wrote: “My parents married when intermarriage was less common than it is today. It was rare to see an Asian man with a Caucasian woman. Growing up in multicultural Toronto, I was never made fun of at school, but I often felt that I didn’t fit in anywhere in particular, straddling two identities. At family functions I would oscillate between feeling equally welcome and alienated at holidays and cultural celebrations. During World War II, my Jewish grandparents survived the Holocaust, and my Chinese family suffered the Japanese occupation of Malaysia. It took me time to determine what racial and cultural affiliations mean to me in the context of the trauma experienced by my family. Sometimes living in a multicultural society highlights our differences just as much as our similarities.